Saturday was a very warm day so I didn't take an extended bike ride, however, I did ride to the TruValue Hardware store, and then took a separate ride over to Higher Ground Autoworx to pick up the VW. By the time I returned with the car TLE had turned on the AC for which I was grateful....it was only just noon time. 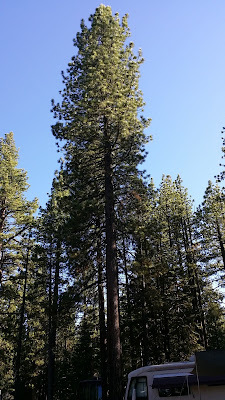 I know...I know....I fuss about the heat, but I am grateful we are spending the summer at 6,300' elevation where you can count the number of 90+ degree days each summer on one hand. It does, however, feel as if we are in the midst of the 'Dog Days of Summer'. I had planned to spend copious amounts of time watching the 3rd round of the 98th edition of the PGA Championship, however, it rained at Baltusrol (near Sprinfield, NJ) most of the day so play was suspended until Sunday when many of the golfers will have to play 36 holes of golf. We arrived to begin our 'night shift' around 3:20 and within minutes were into the flow of the afternoon. I could already feel a coolness in the air that had not been there the past two afternoons. I might add that even though I have had my jacket with me the past 3 nights I have not worn it once.......the night air is quite pleasant this time of year even at midnight. By 5:30 I was already asking folks to turn the volume down on their music.....when I can hear their music 4-5 sites away it's obviously too loud. Most everyone cooperated, however there were a couple who would turn it back up after I left, which required me to turn around and revisit the issue with the recalcitrants. Yeah, go ahead and challenge me and I'll be on you like white on rice. We had a wedding reception in our large movie/music tent that went right up to 10 pm, which is the beginning of our 'Quiet Hour', and they were extremely cooperative when reminded that 10 pm was approaching at 9:45 pm. By 5 after 10 they had retired to their sites for the night at which time I made my 'Quiet Hour' rounds asking folks to turn down the volume on their conversations, and turn off any music. 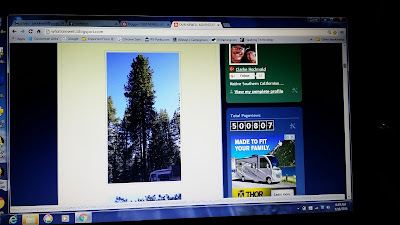 Once again I had a couple of sites where they resisted my suggestion, and had to return several times to get them to shut off the music, and in one case stop chopping wood at 11:15 pm. Having to revisit these noisy sites put me behind and I didn't get to the janitorial part of my job (sweeping, vacuuming and mopping the store/office/lounge areas), which meant TLE and I didn't begin our final bathroom rounds until almost midnight. There were several stubborn commodes which resisted my efforts to unclog them.....maintenance will have to escalate the unclogging efforts using plumber's 'snake' Sunday morning. We punched the clock around 12:25 pm and were almost back to the coach when I got a call from our assistant manager, Victor, advising he had a noise complaint call and would we respond....."Of course" I replied. We were directed to site 446 where we encountered 4 extremely intoxicated individuals (3 males and a female) who were playing music, talking and laughing quite loudly. After spending about 15 minutes urging and cajoling them to go to bed they finally relented and crawled into their tents where I am sure they passed out quite suddenly. We had been home for about an hour when the Ranger iPhone rang at 2:22 am with another noise complaint......this time in site 347 (another tent site). TLE came with me as we drove the cart over to site 347 to encounter loud music, loud talking, loud laughing and many intoxicated individuals. TLE asked to take the lead and walked into the site telling asking them to turn off the music, and go to bed, which they promptly did......maybe she has more charm than I, hmmmm? We decided to made another quick round of the entire park to be sure nothing else was brewing that might draw us back into the early morning air, returning to the coach around 2:40 am, and in bed shortly thereafter. Thankfully this type of night has been atypical of our experience so far. 9:47 am - Saturday - Slept in until 9:15 this morning.....so quiet last night! Another warm day on tap.....I don't think it has rained in 6 weeks, and we could use some to knock the dust down. As you know from reading yesterday's daily missive I was up way too early, and ended up taking at least one 1 hour nap, and a couple of shorties. 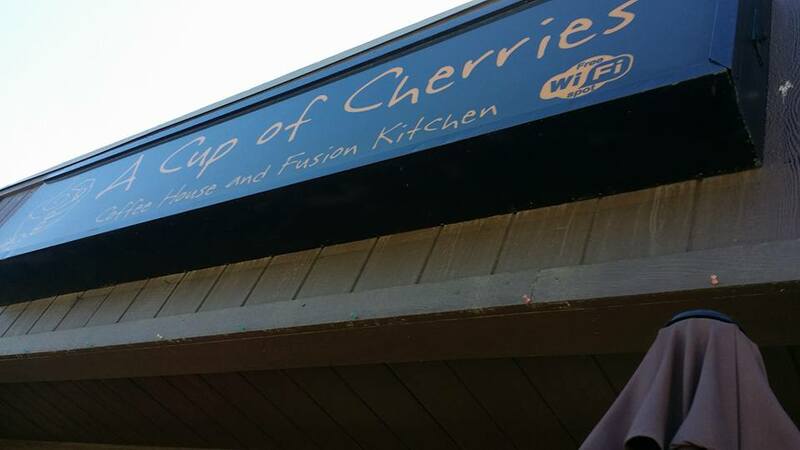 I drove the VW over to Higher Ground Autoworx for our yearly oil change and checkup around 10, and rode my bicycle back to the coach.....it's only a little over 1 mile to Higher Ground. We continue to receive praise from our coworkers about the work we are doing on the night shift getting the office/store/lounge mopped and cleaned for the day shift, and TLE's work at getting all the accounts balanced, and the remainder of the problems remaining from the day shift solved is greatly appreciated. John, our pool guy, loves finding the pool clear and clean each morning, and we 'hear' that the noise at night has been at a minimum since we took over the night shift duties. Everyone who has worked the night shift says the same thing......they don't like the first two hours, but by 5:30 things begin to settle down, and that is my take also. From 5:30 on things calm down and the whole atmosphere is more laid back. Friday night is either movie night, or live music night and this week it was movie night. We featured 'Kung Fu Panda'.....we have a requirement that every adult must be chaperoned by a child. 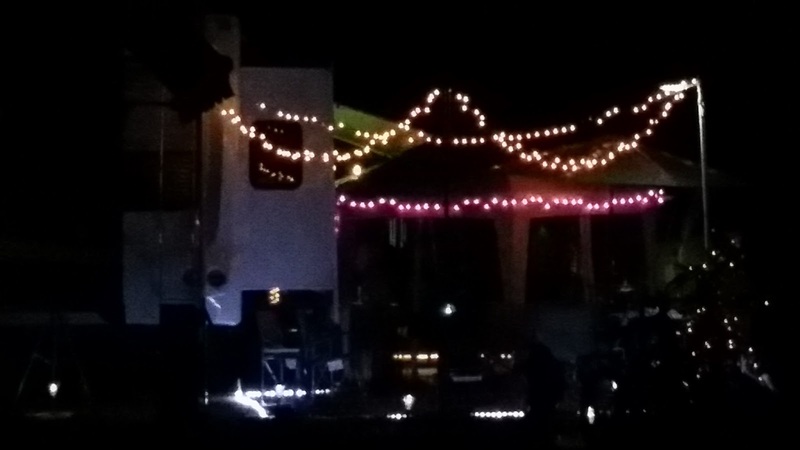 Around 9 pm, just after Heather and I had completed our bathroom inspection round, at least 8 RV's accompanied by trucks, trailers, Jeeps, etc. suddenly arrived completely clogging up our entrance. 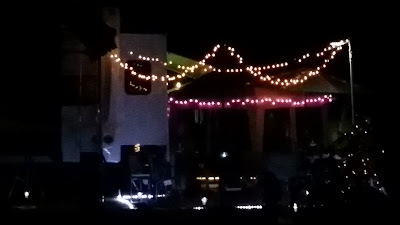 I was helping Heather breakdown the audio/visual equipment from the movie showing and was caught off guard......so many RV's arriving that late at night is very unusual. 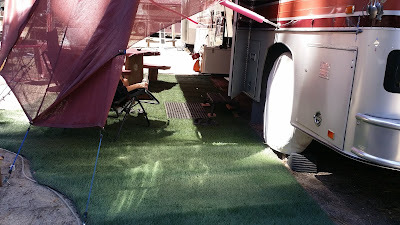 By the time I got out to the entrance the RV's were lined up almost to Melba Drive. I was able to quickly send two of them directly to their sites, and then close up the line thereby opening up the traffic lane again within a few minutes. 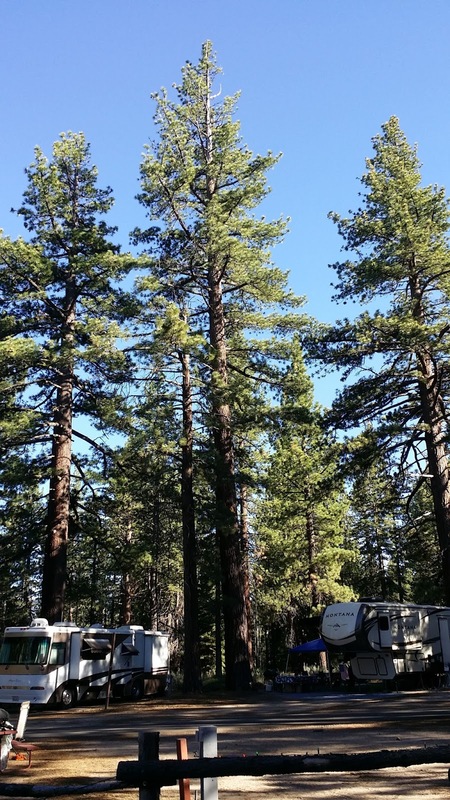 This large group comes every year to run the Rubicon Trail in their heavily modified Jeeps. Fortunately all their sites were in our pull through section (sites 101-111) and I was able to get them all in without dropping their long trailers....some of them were 70' long (RV and Jeep trailer) and were essentially parked 'asphalt to asphalt' barely getting their long rigs off the pavement. Within 30 minutes all the excitement settled down, and things got back to normal. TLE handled the onslaught of people in the office smoothly and efficiently which really helped me outside. I had more than my fair share of clogged toilets Friday night......some of them.....well, you can guess.....are just disgusting. I just close my eyes and start plunging. Most of the clogs can be fixed with just a couple of hard plunges using the PLUNGER, but some require up to a dozen before they disappear into sewer land. TLE and I locked the office doors about 11:30, set the alarm and went on the last bathroom check run of the evening where I continued to encounter more than my fair share of clogs. We clocked out just after midnight with all bathrooms stocked with TP and paper towels, and all toilets running clear and clean. We were home relaxing by 12:15 am. 7:29 am - Friday - I'm up way too early, but "c'est la vie".....there are always naps. Now, if I can just get my brain working while the broadband is still fast.......the last two weeks the Verizon broadband has stunk here in SLT. There are just too many people here (SLT) and the local cell towers are overwhelmed.....it works pretty well after 10 pm and before 8 am, but from 8 am until 10 pm at night it stinks. Thursday the high got to 89 again....I got a late start (10:30 am) on my 21 mile bike ride and by the time I returned it was getting quite warm. We turned the AC on by 12:30 pm and it was on until we left for work at 3:20 pm. The temperatures will begin to GRADUALLY cool off over the next 10 days getting back down to 80 by August 11th, so we are in for mid to high 80's for the next week and may get into the high 70's a couple of days through the end of August. As always, this is the warmest time of year here in SLT. Down in Carson City it is over 107 each day, so I really have little to complain about, right? 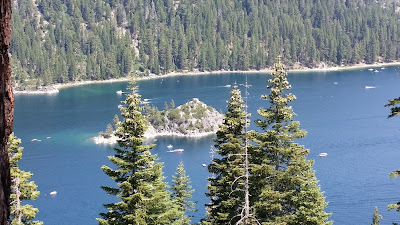 At any rate, I took the aforementioned bike ride doing my 21 mile loop out to the end of the Emerald Bay Road bike path, then picked up the bike path that runs along Lake Tahoe Blvd. and Sawmill finishing up my ride heading west on US-50. Other than the bike ride my only other ambition for the day was to rest up for our night shift. Starting at 3:30 pm puts us right in the middle of the highest temperatures for the day, and until after 7 pm it was pretty miserable outside. 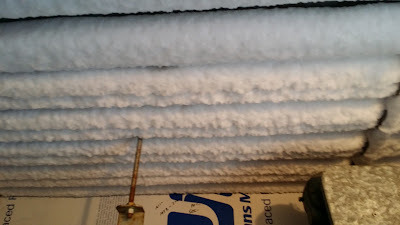 Of course TLE was inside the office/store where the evaporative cooler keeps things bearable. My shift began helping a customer move from one site to another as he believed the low voltage (109 volts) was causing his 'transfer switch' to shut off electrical power to his coach. 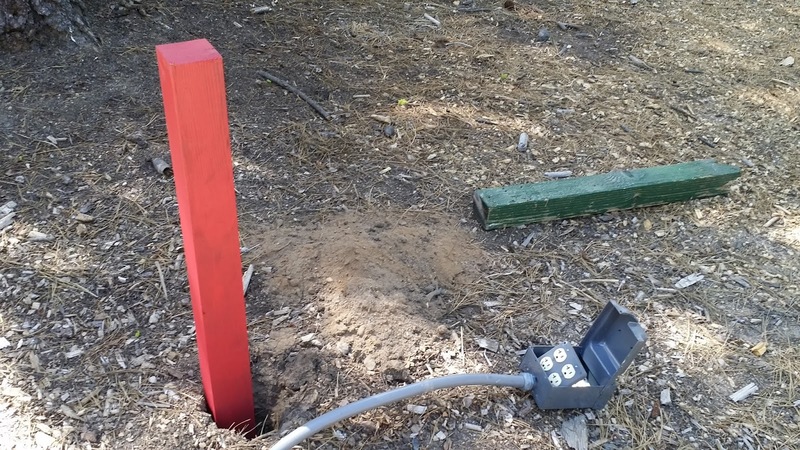 At the new site he had 50 amp service and 120 volts, but the problem persisted, so we concluded the problem was his transfer switch failing. Naturally, on hot days most everyone in the park with AC is using it and that can cause a voltage drop especially in our older 30 amp grid in Section G.
I spent the entire shift running from one thing to the next......clogged toilets (there were many), quick set up for karaoke night (all the chairs were stacked and had to be deployed in rows), site encroachment complaints and on it went. All that being said, I still prefer the night shift, especially since it only gets cooler throughout my shift, not hotter, and it gets more laid back. We are seeing large turnovers each day now.....a hundred or more departures and the same for arrivals. This is the hectic part of the summer, but it will begin to slow down in about 10 days.....just about the time the weather begins to cool once again. We 'ran' the restrooms (checked them for adequate paper towels, TP and clogs) around 11:30 pm, and clocked out just before midnight.......I had to take care of 3 more clogged toilets.....yuk! 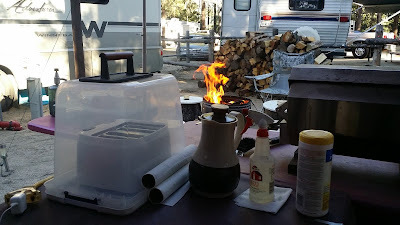 We stayed close to home all day Wednesday.....nothing much to report except we (the royal 'we'.....I watched) did cook breakfast outdoors, and ate it outdoors. We knew the high temperature for the day was forecast to be at least 90.....it got to 89, but it sure felt much hotter as there was virtually no breeze all day. 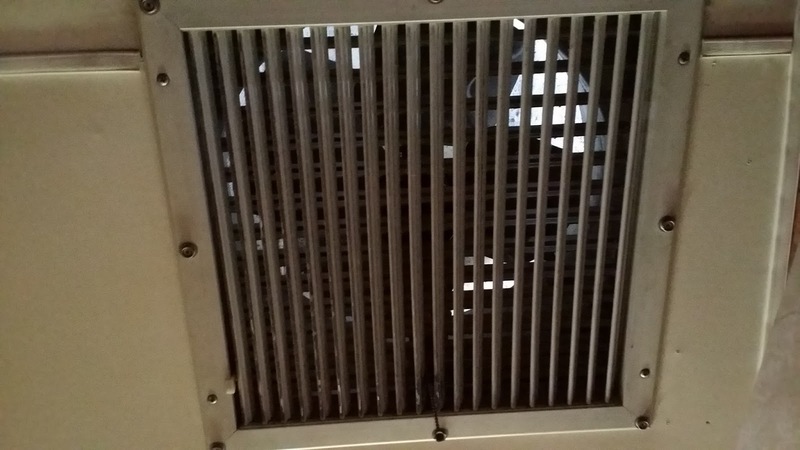 I spent about an hour removing, cleaning and re-installing our 'attic' fan. It had begun to develop this 'rattling' sound after being on for about 5 minutes so I wasn't sure if the bearings in the fan motor were going bad, or the bracket that holds the motor in place needed to be tightened. 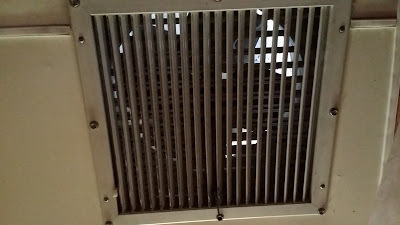 At any rate I cleaned the fan blades, put a little '3 in 1' oil on the shaft, then re-installed it making sure all the bolts and nuts which hold the fan in place were tight. I turned it on and it ran flawlessly for an hour before we turned it off to turn on the AC for the second day in a row. Around 5 pm we turned off the AC, opened up the windows and went outside to enjoy the cooling evening air. Around 6:30 I fired up the Sea-B-Que in preparation so I could grill two filet mignons and some corn for dinner. Once again we ate outside and sat talking until after 9 pm as darkness once again enveloped the TVC landscape. The mosquitoes have essentially disappeared at night now that we are deep into the summer season so our decision to go inside for the night was not dictated, for once, by their presence. So, in review, Wednesday was a very lazy, do mostly nothing day for us.....the kind of day you need one in a while whether you live in a 'sticks and bricks' home, or a home on wheels. 9:24 am - Wednesday - I alluded to how I felt yesterday morning after putting in 7 strenuous hours defrosting the ICE HOUSE Monday evening. 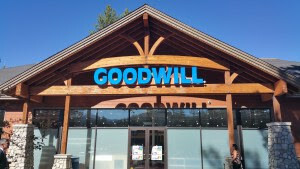 I took several naps during the day and other than walking over to check out the new Goodwill (in the building that previously housed Pier 1 Imports) we did very little all day except relax. The inventory at this new Goodwill is the best I have ever seen. Great sporting goods section, and great camping section as well as great clothing and shoe selections. We both found some clothing items we could not live without, and TLE found a couple of hardback books. We are in the midst of another heat wave that will extend until the first week in August when temps will again drop into the high 70's/low 80's. Tuesday it got to 87 degrees and we actually had to turn on the AC for the fourth time this summer around 4 pm. 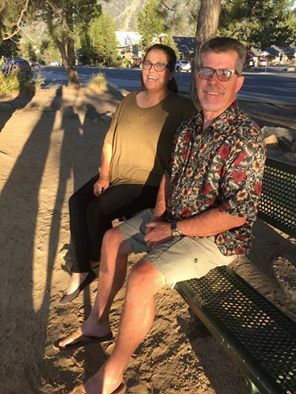 We got a surprise text from our daughter, Meredith, that she was in the Sacramento area on business and wanted to drive up to SLT to have dinner with us......she arrived around 5:30 pm and we headed over to Sidellis Lake Tahoe Brewing. Their outdoor 'Beer Garden' is now open, so we sat outside sipping good local brews and enjoying a good meal for over an hour. .....regretfully Mere had to head back to her hotel about 8:30 (it's a two plus hour drive each way), so we said our 'until next times' and bid her adieu until late September. We got a text from her about 10:30 that she had arrived back at the hotel safely. We watched a recorded episode of 'Last Ship' and were in bed by 11:30......I slept in until just before 9 am this morning! 8:51 am - Tuesday - My good friend Tom Carrozzo has a wonderful, descriptive saying to describe how one might feel after a long night.....it goes "I feel as if I have been drug through a knothole backwards"......and that is precisely how I feel this morning after Monday's adventures. .....of course, after the hard climb to the top the reward of the fast descent awaits. I usually get up to 35-36 mph on the descent and listening to music on my Samsung phone just makes it even better! 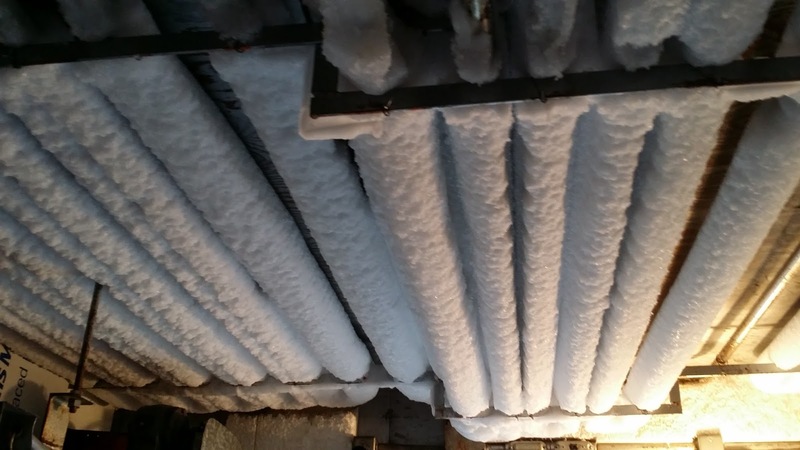 .......I finally had all the ice off the coils, had all the ice (looked like snow) shoveled off the floor and all the water mopped up around 11 pm. I turned the compressor back on, closed and locked the door and headed back inside to help TLE finish sweeping and mopping. We did our inspection of the restrooms and were home decompressing by 1:15 am.....that was a long, long shift! I rode my bike over this morning about 8 am to check on the temperature and it is back down to 18 F degrees and falling, so the defrosting was a success! So, now we are off work Tuesday and Wednesday and back on Thursday at 3:30 pm. After 4 days of our night shift we are still loving it! 8:29 am - Monday - Last of 7 straight days of work.....good night's sleep, however, the Ranger Phone rang for the first time at 2:36 am. The customer, who had just arrived.....why people think arriving at a strange place at 2:36 am is a good idea I have no idea.....could not get into site 236 because a car was blocking the site. 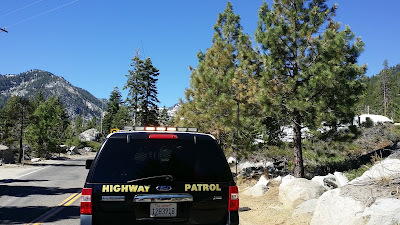 I suggested they park their RV in the registration line and wait until 8 am when a ranger would be on duty to contact the people who's car was blocking their site. They agreed and apologized for calling so late/early. I gave myself the day off from riding my bicycle and watched the end of Le Tour de France won by Chris Froome for the 3rd time. There never seemed to be any doubt that he would win once he donned the yellow jersey after Stage 8. I always enjoy watching the peloton race up and down the 'Avenue des Champs-Elysees'.....it is quite a spectacle! After that ended I watched most of the final round of the American Century Celebrity Golf Championship which is played right here in South Lake Tahoe at Edgewood Golf Course every July. We always know when the tournament is about to begin as dozens and dozens of corporate type jets can be heard landing and taking off at the SLT airport, which is less than a mile from TVC. So, Sunday night....what did that look like? On Sunday's, as I wrote a few days ago, our shift is from 3 pm until 11:30 pm (half hour lunch). The first hour was a little hectic, but things settled down just after 4 pm and I met my friend Harry over at our site to work on finishing the installation of the red/blue flashing light bar on top of the Ranger Cart. 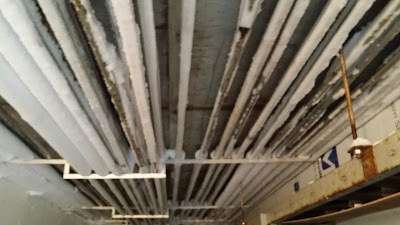 The light bar had previously been on an old Chevy S-10 pickup, but had been sitting in one of the maintenance sheds for the past 8 years, or more, unused. At Harry's suggestion I retrieved the rest of the wiring harness from the S-10, which includes the on/off switch, so we could wire it up. It took just under 30 minutes to finish and the end result is we now have a working emergency flashing light bar! (Pictures to follow tomorrow). Sunday evening was probably the easiest night shift for me yet.....not so much for TLE, but I'll let her expand on that at a later date if she so wishes. I made many rounds of the park, helped folks into their sites, answered questions, unclogged 3 toilets, checked restrooms to be sure there were adequate supplies of paper towels and TP, balanced out the PH levels in the pool, added water to the pool, picked up trash, kept watch on the entrance, directed traffic, slowed people down and just generally had a nice, smooth, enjoyable evening. While TLE closed out Sunday's office/store accounts I swept, dry mopped and wet mopped the store, bathrooms, and lounge and then TLE and I made one last round of the four restrooms checking once again on paper towels and TP before punching the clock. We sat talking and unwinding for about an hour before heading to bed just after 1 am.....another good day, errr night, on the night shift! 10:49 am - Ahhhhhh......my body is finally adjusting to the schedule change! I slept in until after 9 am this morning and lazed around until now watching the end of Le Tour de France.....it's kind of nice just being lazy once and a while. So, what did Saturday have for us? 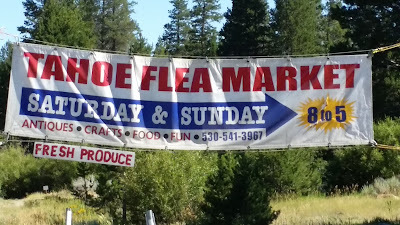 I began Saturday with a 22 mile bicycle ride around South Lake Tahoe which included a stop at the Tahoe Flea Market where I found a pair of Channel Lock dykes I couldn't live without. From there I rode to the end of the bike Emerald Bay Road bike path and back arriving back at the mother ship just after 11 am. ......as I make my rounds after dark I pass by many interesting light displays to which I am always comparing ours. I arrived back at the office/store around 10:45 and began to sweep the floors of the store and lounge, empty the trash cans, and then wet mop where necessary (lounge, bathrooms, and the front entry), help TLE straighten up the desk area, lock up and then make our final bathroom check rounds (I do the first one with one of TLE's office helpers, Heather, around 9 pm).....we check to be sure the paper towels and TP are in good supply, and all paper is in the trash cans where it belongs. We finished the fourth and final bathroom just after midnight, clocked out and headed for the barn. I was in bed by 1 am, and TLE followed shortly thereafter......yep, we are thoroughly enjoying our new schedule! Much less stressful and laid back! 7:22 am, Saturday - Of course.....you guessed it......even though I didn't go to bed until after 1 am I woke up at 6:30 this morning......ah well, there are always naps, right? It will take me a few days, if not a week, for my body to adjust its clock to my new schedule. TLE, on the other hand, is still sleeping like a baby as I write. .....as I approached Camp Richardson I decided to take the Fallen Leaf Lake spur of the bike path and add a few miles and some good climbing to my ride. 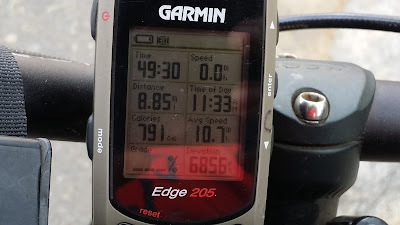 By the time I arrived back home it was around 11:30 am and I had covered close to 19 miles. I drove the car over to DIY to pick up some new fluorescent light tubes to the ones in the trailer that have begun to fail. I was back by 12:30 and spent about 30 minutes puttering around in the trailer before heading inside to take a nap, then a shower before our shift began at 3:30 pm. We arrived for our shift around 3:20 pm. Already I could feel a different vibe in the air. Things seemed more laid back.....relaxed, if you will. We were just past the heat of the day and I could already feel the temperature dropping as I got in my golf cart to keep my eye on the entrance. We still had some 60 arrivals expected so I was sure things would get busy soon, which they did. It took me an hour or two to adjust to my new roll. Instead of doing site checks, which were done in the morning I followed up on some minor issues left over from the day shift.....a tent camper had pitched his tents on the wrong site of his site post (352) and was mostly in the site of his neighbors. There was one gentleman in site 251 which could not put his 5th wheel out of the site as his neighbor's car across the street was in the way (the car was legally parked). The tenter eventually returned from site seeing about 6:30 pm and moved his tents. The guy in 251 was finally able to leave his site around 4:30 pm so the guy in site 150 could move into that site. The rest of the evening revolved around me learning how to test the chlorine and PH levels in our swimming pool, filling propane bottles until dusk, unclogging three clogged toilets in various restrooms, wet mopping out the store and ice cream shop after 10 pm, making sure all the restrooms had plenty of paper towels and TP, taking out the trash, and driving around the campground to be sure everyone was observing the quiet hour which began at 10 pm. There were only 4, or 5 sites where there was excess noise and they quickly quieted down after I stopped and reminded them about quiet time. Most people kind of lose track of the time and are apologetic,and that was the case Friday evening. TLE and I made one final round around midnight through all 4 restrooms to be sure the paper products were topped off before punching the clock around 12:19 am. 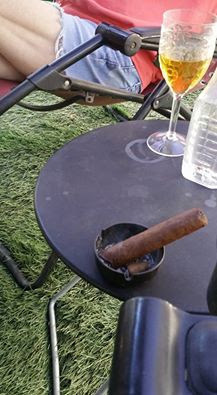 We spent about an hour relaxing and unwinding from our first night shift. I did not arrive home feeling spent, or tired like I have on the day shift......we both thoroughly enjoyed our first night on the job and are looking forward to continuing on with our new schedule. 7:44 am - Friday - So nice to get up at 7:30 am instead of 5:30 am......Friday is the first day of our new schedule which has settled out this way.....Thursday, Friday, Saturday we start our shift at 3:30 pm and are off by 12:30 am, and Sunday, Monday we begin at 3 pm and are off by midnight.....this will be our schedule the rest of the summer 'God willing and the river don't rise' as they say. Of course, this also means you will be seeing my daily posts later in the morning each day. So, what happened Thursday? Overnight TLE had this brainstorm about how to handle the increased traffic which results each year from the influx of the two tent meeting church groups. Typically our entrance is bumper to bumper each morning as the attendees who are not staying in TVC drive in for the meetings. Then the reverse happens as they slowly egress from the park. TLE suggested we open up the fence along Melba Drive near where the tent meeting folk park, and let them ingress directly from Melba and egress directly on to Melba......this will remove the twice daily traffic jams. I presented the idea first to James and Keith (TFE folks) who loved the idea, so then I talked with Adam (our maintenance manager upon whom much of the work will fall) and then to Robert our manager.....they all loved the idea and gave the green light to proceed. 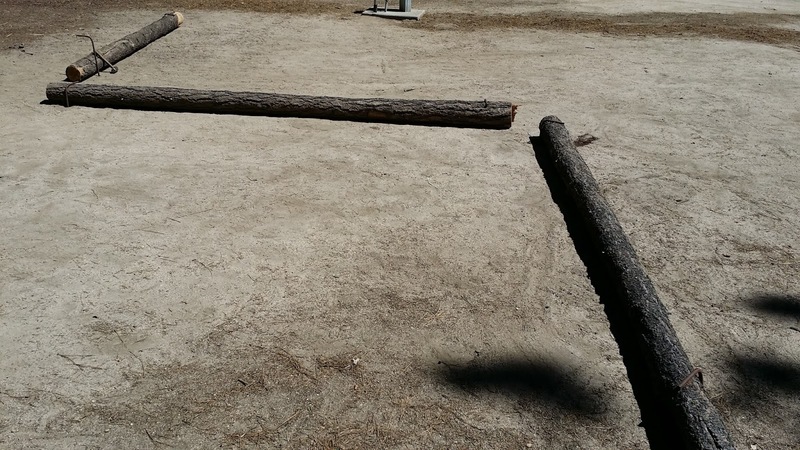 Adam quickly had the fence cut, and rolled back to create the entrance/exit. On Friday Alex will use our loader to create the 100 foot access road. I got our remaining stop sign, and one 'RIGHT TURN ONLY' sign to place at the exit point and had them installed by late afternoon. The rest of the day I made my rounds checking on the departures and found we had several folks who had not left their sites by 11 am (checkout time). One guy claimed he had paid for his site through Saturday and was refusing to leave. Another was waiting for him to leave so they could move into his spot. Another man couldn't leave his site due to a malfunction with one of his leveling jacks on his 38' Class A motorhome. So my morning and early afternoon were filled with trying to break the log jam of non-departures. The guy who was refusing to leave could only produce paperwork showing what we already knew to be true.....he had only paid through Wednesday night. He ultimately relented and departed in a huff about 1 pm allowing the other guy waiting to move into his site to move allowing the guy waiting in our registration line to move into his site. Yup, it seems like a game of dominoes sometimes, or as TLE says "Jenga blocks". The guy with the broken leveling jack called an RV repair guy who was able to jack up the motorhome and then remove the defective jack.....he was finally able to depart about 2 pm.....the person coming into his site had not yet arrived so no one was inconvenienced. The takeaway from this was that except for the one unreasonable gentleman everyone else was understanding and patient. My faith in humanity has been somewhat restored. 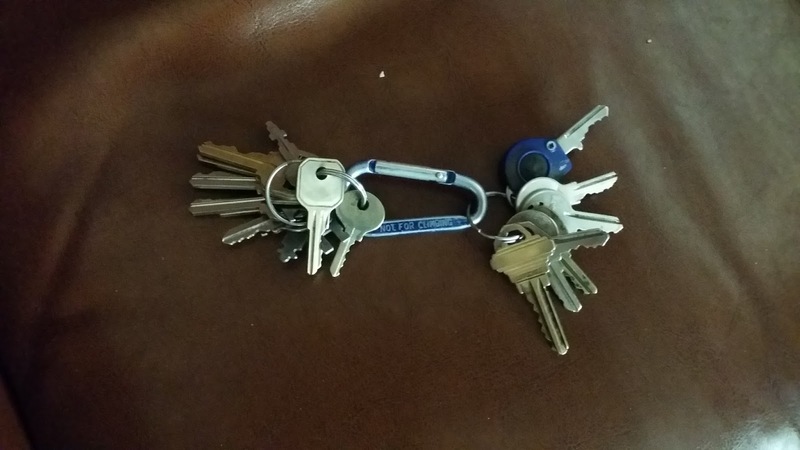 Sometime late afternoon I realized I had lost my personal set of keys that I keep on a blue carabiner with my set of TVC keys. I hate losing things.....don't we all? I began retracing, as much as I could, everywhere I had been that day, and even checked the 'Lost and Found', but by the time I clocked out and headed for home about 4 pm I had resigned myself to the loss of the keys. TLE arrived home shortly after I did and as she was putting her bike back in the trailer I heard her say "Clarke, are these the keys you are looking for? 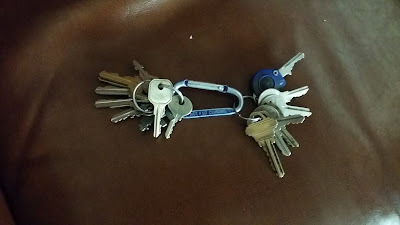 ".....she came to the door of the Newell with my keys in her hand.....apparently they had fallen off the carabiner when I closed the trailer after picking up my tool bag about 9 am, and I had not noticed them missing until much later in the day. We needed to do some shopping so TLE and I headed first over to 'Classic Cue' for some fish tacos and a pitcher of 'Payback Porter' before heading to Raley's to pick up what turned out to be a large basket of 'necessities'. I should have known when TLE suggested we drive the car instead of walking that we were getting more than a few necessities.....:-) We were home by 6 pm relaxing and looking forward to sleeping in Friday morning! YAY for us! 5:54 am - Thursday: As I write this morning I am struggling with a few issues with my computer....I finally succumbed and upgraded to Windows 10. I always dread these software upgrades whether on my phone, or laptop. There are always a few bugs to work out and one of mine is my sound no longer works. Apparently I'm going to have to uninstall a couple of programs and then re-install them to get the updated Windows 10 drivers. I feel like I have lost 5 hours of my life I will never get back. Also, as I write I am realizing this is the last morning I get up at 5:30 am in order to be at the office/store with TLE to open for the day. Friday I will be able to sleep in, and not be at work until 4 pm. I'll have time for a solo bike ride, which I have not had time to take for a while. We are both looking forward to our new schedule. So, what happened Wednesday? Well, the TFE people (Tahoe Family Encampment - Seventh Day Adventists) began arriving to set up their large circus type tent, and get ready for their week long tent meeting. The influx of the advance party, and then the arrival of the attendees will put us near 100% capacity for the next few weeks. Why 'weeks'? Because they are followed immediately by another church group who will use the same facilities for a another week long tent meeting. From beginning to end it all lasts about 3 weeks. My rounds went normally.....no issues, so I went down to the maintenance yard to pick up my red paint and brush to work some more on painting the many tent site posts which have been neglected for a decade, or more. I did that for a while and then about 11 am I set out to make sure all those on my 'Departure' list were either departing, or departed. I ended up with two who had not departed at 11:10 am, and one of them was out fishing.....the other was waiting to move into the spot occupied by the fishermen. The fisherman finally returned about 11:30 to move to their new site, but they had an issue with their automatic awning refusing to be automatic. They finally, after an hour, had to manually retract it, but finally about 12:30 they moved, and then the other folks were able to move. 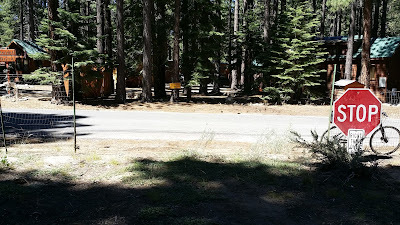 As you know I recently put up 5 'No Stopping Anytime', 'No Parking Anytime' signs along the exit road to keep folks from stopping/parking to attach their 'toads' (private passenger vehicles which are towed behind a motorhome), or fiddle with their trailers, etc. which causes traffic to back up and also creates an unsafe situation with cars attempting to pass by entering the opposing traffic lane. I don't catch as many people stopping there as I used to, but there are a few souls undaunted by the numerous signs forbidding what they want to do who stop anyway. When I drive up and ask them if they noticed the signs they always say "yes, but"....the "but" part is always amusing to me. Yesterday the gentleman's excuse was his wife had a 'medical emergency' as they were rounding the corner, and he had to stop. I looked around for the ambulance, the flashing lights and listened for the sirens, but saw and heard nothing. 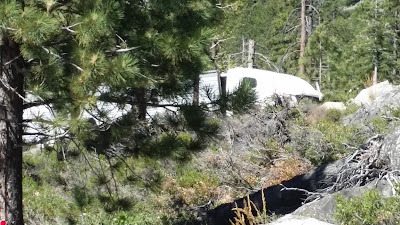 I noted it was the wife who exited the truck and walked back to the trailer rather casually......nothing emergency looking about her whatsoever.....go in the trailer and emerge a few minutes later. She apparently forgot some medication inside the trailer....that was her "medical emergency". You've got to love it, right? 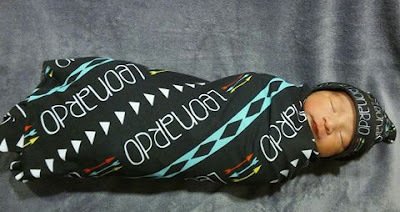 We only had 50+ arrivals scheduled for Wednesday, which is not normally a big deal, except they all apparently decided to arrive between 1:30 and 3 pm.....that was a crazy 90 minutes! 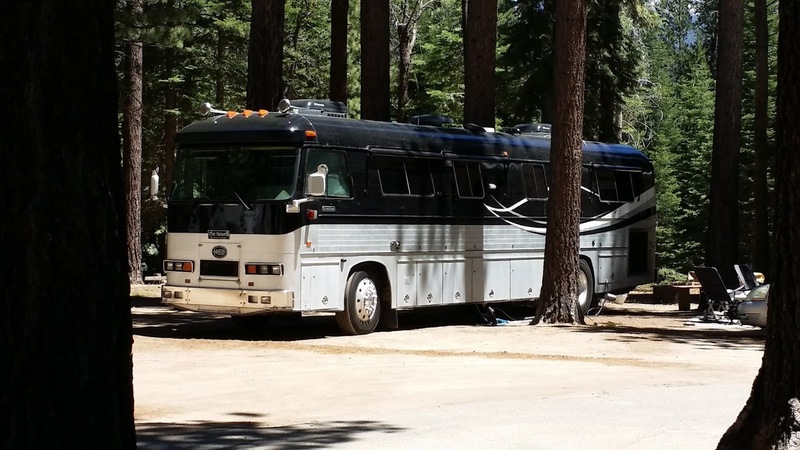 Several times I had RV's backed up to the trolley station, but managed to keep them moving to their sites using our speedy check-in system. Since Wednesday was the end of the current two week pay period and I hit my 80 hours by 3 pm I punched the clock and headed for the barn.....TLE followed a hour later to find me napping. She prepared Margaritas for our cocktail hour on the veranda and we sat talking until close to 6 pm before we ate dinner. We were in bed by 9:30 pm.....the last time we do that for a while! Thanks for stopping by! Oh! By the way, we just found out my brother, Philip's son Ryan and his wife had their second child last night.....welcome to the world Leonardo Ryan! Our extended family continues to grow.....hello Leonardo! Tuesday began as most days for me here at TVC and then proceeded to morph into something completely unexpected. Just after I finished my morning rounds I picked up a can of red paint and a paint brush from the maintenance shed intending to spend a few hours applying a new coat of paint to the tent site posts in Section E when I heard a call over the two way radio indicating there was an issue with the electrical in the group bathrooms, and the group kitchen......the problem? There was NO electricity. I met Adam there and he told me he had come in Monday (his day off) for 5 hours trying, with our electrical contractor (Winters Electric) to figure out how to restore power. They had not been able to figure out what the problem was so here we were again on Tuesday trying to figure out what happened. I called my friend Harry who worked here at TVC last year and was very familiar with the electrical grid.....he lives just a couple blocks away and met us at the group restroom in 5 minutes. With Harry's help we devised a temporary solution to restore power at both locations. The two group restrooms do not need a lot of power......just lights and a fan, and the group kitchen just has lights and a couple of 110 electrical outlets, so we first decided to (temporarily) run a 'jumper' from the electrical pedestal in 481 by plugging into the 30 amp receptacle using a male 30 amp plug and then connecting that to about 30 feet of Romex which we ran to the group restroom breakers where we wired it directly into the breakers. We flipped the breaker at the pedestal then the two breakers at the restroom and we had lights and fans! Next we went to the group kitchen where we tapped into the 50 amp box there, which is on a different circuit, connecting to one of the 50 amp legs, the neutral and the ground with another 6 foot length of Romex which we ran to the junction box inside the kitchen area. Within minutes we had power restored to the kitchen. Mind you, these are temporary fixes. 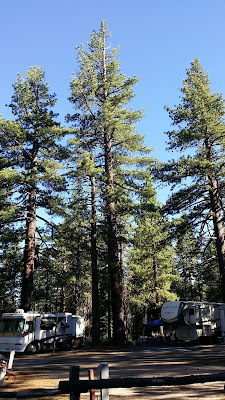 It appears, that like happened in our site, one of the underground cables has failed which will involve a lot of digging, which we cannot do with the park so full of RV's and tenters right now. Thank you Harry for your time and help....we couldn't have done it without you! By the time we finished with all that fun....and it was fun.....it was 1 pm and I hadn't eaten lunch yet so I 'clocked out' and headed for the Newell to have a sandwich. In the mean time TLE was spending time with Robert, our manager, working on a new schedule, which I alluded to in yesterday's missive. The big change, which has been approved by both Robert and Victor, is that TLE and I will take over the late shift beginning at 4 pm each day we work until 1 am (an hour lunch is factored in). The problem we have run into is the two folks assigned to that shift have not been doing the job, and really need direct supervision so they will transition to the day shift where they (a couple of 20 somethings) will have plenty of supervision. Personally I would have fired them, but I am not in charge. At any rate we are both excited about the change. Why? Well, right now I get up at 5:30 am to be on the job by 7:30 am.....by the time I get home after 8 hours of work I am tired and don't feel like riding my bike, or doing much else for that matter. Under the new schedule we will be off by 1 am (I'll be doing night rounds/security and helping TLE clean the office/recreation room/laundry each evening after 10 pm to make sure they are ready for the new day). I'll be in bed by 2 am, up by 10 am feeling fresh and ready for a ride.....we don't go to work until 4 pm so there is time for a nap, and relaxation before we go on duty. I think I will like this better, and so does TLE. We are, after all, used to working the late shift at Amazon and do quite well at it. The change goes into effect beginning Friday! I did finally get to that painting I had planned to do in the morning and got three site posts painted. I'll work on the rest Wednesday. We were home a little after 4 pm knowing we only have two more early mornings before our new schedule kicks in. We sipped some wine, then TLE made some eggs and french toast for dinner. You might recall that our daughter, Meredith, visited here at TVC with her friend Amy a couple of weeks ago. On their way out of town and back to SoCal they stopped off for breakfast at a place near Stateline called 'A Cup of Cherries' on the spur of the moment. They raved about their breakfast of Island Pancakes and insisted we must go there for breakfast one time. 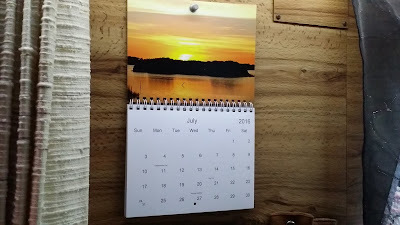 Just after I finished dumping the tanks I made a call to Sunset Isle RV Park in Cedar Key, FL to make reservations for 5 weeks beginning in January. It has been a few years since we were last there and 2017 is the year we will return. .....we found an alfresco table just outside the entrance and quickly snagged it. 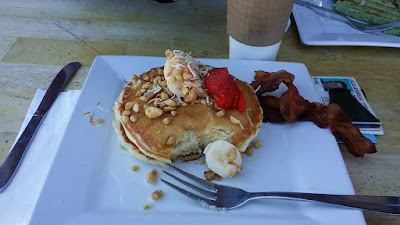 Of course I had to order the Island Pancakes which come with perfectly cooked bacon.....as my daughter remarked, "It is magical", and I would agree. Yelp gives them 4 stars on over 400 reviews.....spot on! About 11:30 we continued our 16 mile loop by riding further east on US 50 to the intersection of Ski Run Blvd. where we turned south for a few blocks to pick up Pioneer Blvd. where we turned west covering about 7 miles once again connecting with US 50 where we turned east once again to head for the barn. We were back home by 12:30 sitting in the shade and relaxing. I spent part of the afternoon talking with our current neighbor, Scott, who is an instructor of Yoga instructors.....he teaches others how to teach Yoga. In addition he is an acupuncturist, and an herbalist. 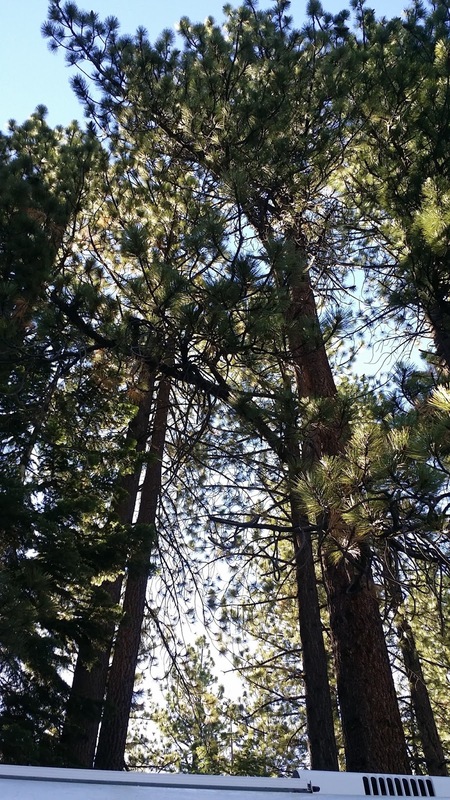 He travels around the world teaching yoga, and uses South Lake Tahoe as his base. He has lived in SLT for over 40 years, and became a full time RV'er about 2 years ago when he decided to simplify his life.....a very familiar story. .....I savored every puff! At 6 I grilled up some carne asada for street tacos to accompany some Mexican (pinto) beans TLE had been preparing all day. We sat talking until well after 7 pm before heading inside as the chill of the evening began to descend over TVC once again. In closing, there are some possible schedule changes coming for us later in the week. Right now the changes are in the discussion stage with our manager, Robert, but we should know in the next couple of days if they will come to fruition. The changes will be dramatic for us, but are totally our idea. Robert seems to be buying into our suggestions, and we are very excited about the new possibilities for us.....stay tuned! 6:35 am - Monday - As I wrote yesterday morning (Sunday) I was up watching the British Open at 7:34 am. By the time I tuned in Phil Mikelson and Henrik Stenson were tied at 14 under par. As the morning progressed they were tied at 17 under with 2, or 3 holes to go and then suddenly Henrik pulled ahead by two strokes, then finished with a birdie on the 18th and final hole to win by 3. The nearest competitors to these two were 14 strokes behind Henrik Stenson when it was over, and 11 behind Phil. Phil Mikelson made no mistakes......he had a bogey free round......in essence he got beat by 10 birdies in 18 holes by Henrik Stenson. It was one of the most amazing finishes at a Major I have ever seen, and I am so grateful I was off work Monday to watch it happen. .....it's hard to tell the awning mat is back there in the picture above as the intense sunlight washes out the color in the picture. TLE had the vision of how to lay it out, and I helped execute her vision....it came out wonderfully, and we love our new environment! .....we went inside around 7:30 and watched a recorded episode of 'Last Ship', then 'Naked and Afraid: XL'......in the regular 'Naked and Afraid' they must survive for 21 days without clothing, or shelter.....in the XL version they go 40 days and there are 4 three person teams deployed with miles of each other. This season they are somewhere in South Africa living in one of the most inhospitable places on earth right along with lions, tigers, elephants, etc. We were in our wonderfully comfortable bed before 11 with smiles on our faces, and grateful we were not sleeping on the ground with ticks, naked and afraid! 7:34 am - Ahhh Sunday, sweet Sunday.....a day off and I managed to sleep in two hours beyond my normal rising time. Saturday with it's 96 arrivals was a total outlier......a typical Saturday is 40-50 arrivals and a like number of departures. As soon as I saw the numbers I knew it was going to be a busy day. My morning rounds took longer than normal due to the occupancy rate being near 100%. I was on my way back to the office/store when I noticed someone had parked a Class A motorhome at the stop sign coming out of Sections A & E facing the office/store. This happens occasionally, but it is beyond me why any mature adult would think it was safe, legal, or proper to park their vehicle at a stop sign and walk away. We have narrow roads within the park and the only result on a Saturday morning with all the attendant activity will be traffic backing up, and people trying to go around the parked vehicle, in this case a large motorhome, blind. A perfect recipe for a vehicle verses bicycle, or pedestrian accident. As it turned out the driver was in the office/store filing a noise complaint from the night before. I entered the store and asked for everyone's attention. I then asked who owned the Class A motorhome parked at the stop sign. Everyone near me said 'Not me', then I spied a gentleman standing at the back desk talking to one of our staff....he had not responded so I walked over to him and asked him if that Class A was his. He replied that it was.....I told the staff member that whatever they were talking about (the noise complaint I later learned) was unimportant at this point........I had to have him move his motorhome immediately as he had created a dangerous situation. He didn't feel he was done venting his spleen and continued on about the noise form the night before. 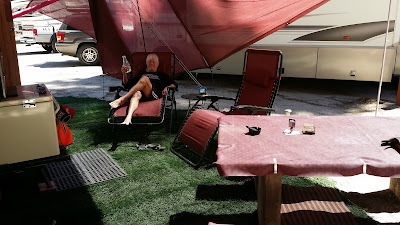 I again said "Sir, you must move your motorhome immediately! You are putting people at risk! ".....he finally turned and came with me. On our way out to his rig he continued to complain to me and then said he only parked there because he needed to use the dump station and didn't know where it was......I pointed out he was parked directly next to a large yellow and blue sign (6' x 8') with the word "DUMP" and a large arrow pointing the direction to the dump station. Then it came out he really parked there because he was mad at us......this final statement coming from a Boy Scout Troop leader in uniform. I wondered to myself how his actions comported with the Boy Scout Pledge (#2 - Duty to other people).....it probably didn't. Apparently in the mind of this supposedly mature adult Scout leader he was justified in setting aside the pledge and put people at risk all because his neighbor had been too noisy the night before. I wonder what lesson the Scouts sitting in his motorhome will retain in the years to come from this weekend.....probably the last thing they witnessed. The rest of the day saw me running from one task to another.....pumping propane, watching the entrance drive, taking people to storage to drop trailers, answering questions, assisting folks into their sites, etc. I was determined to be off the clock by 4 pm and not work one minute of overtime......at 3:40 I drove my cart back to the yard, washed and dried it, put it in the cart shed, plugged it in and was back to the office at 3:58 to punch the clock. 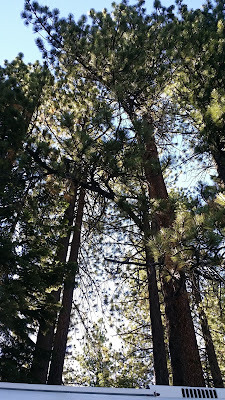 I beat TLE home by 15 minutes and was just ending a deliciously hot shower when she came in the door......I got dressed quickly and began our walk over to Lake Tahoe Pizza for a pitcher of 'ICKY' IPA and a Jackpot Pizza replete with anchovies. We sat talking and unwinding from our work week for over an hour before beginning a slow ambling walk home. I just felt like I needed to get off site for a while and it worked wonders. I spent the evening watching a recording of Saturday's British Open round dominated by Phil Mickelson and Henrik Stenson....what a great round. They will both be paired for the final round Sunday, and as I type I am watching a 'duel to the death'....the lead has changed hands 8 times in the last 12 holes!! "If it weren't for the honor....."
Friday we edged closer to 100% occupancy.....we even have three, count them, three large groups in the Group area, and another large group renting most of our tent sites in Section E. Friday felt, and looked a lot like the 4th of July weekend without the attendant noise. According to Victor, our assistant manager, our bookings are up 30% from 2015, and we will be at, or near maximum occupancy the rest of the summer. As my father used to say, "Clarke, if it weren't for the honor, I'd just as soon pass on that....". The 'Arrivals' report showed 126 for the day.....yup, feels a lot like 4th of July. Prior to making my morning rounds I picked up trash around the office/store which includes the playground in back.....the amount of trash was surprising, and disappointing. We provide a lot of trash cans but somehow people have no time to walk a few feet to drop an empty, or almost empty plastic bottle, candy wrapper, or popsicle stick in one. ......the ground was soft, so it took just a minute, or two to dig the new hole, then reattach the outlet, and secure the conduit.......just as I was finishing I got the first of many calls requesting assistance to help someone into their site. The closer we get to 100% occupancy the more difficult some sites become to enter. I alternated between watching the entrance so traffic did not back up, and helping folks get into their sites the rest of the day. It got so busy near the end of my shift that I wasn't able to clock out at the usual 4 pm.......TLE and I finally extricated ourselves from our shift about 5:15 pm and headed for the barn. Just before the end of the day the reservation system crashed, and didn't come back up until after 6 pm, so, no doubt, there will be a lot of catching up to do Saturday morning when we clock back in for the last day of our 5 day work week. On a side note I just noticed we passed 500,000 views of our blog a couple of days ago.....we currently stand at 500, 807. I say often that I am always humbled, and surprised that anyone besides my children and close relatives read my daily ramblings, so a big 'THANK YOU!' to all of you who take the time to read, and sometimes comment......I do appreciate all of you who follow our adventure. We're at that part of the summer when one day begins to blend into another, and I wake up some mornings wondering what day of the week it is. 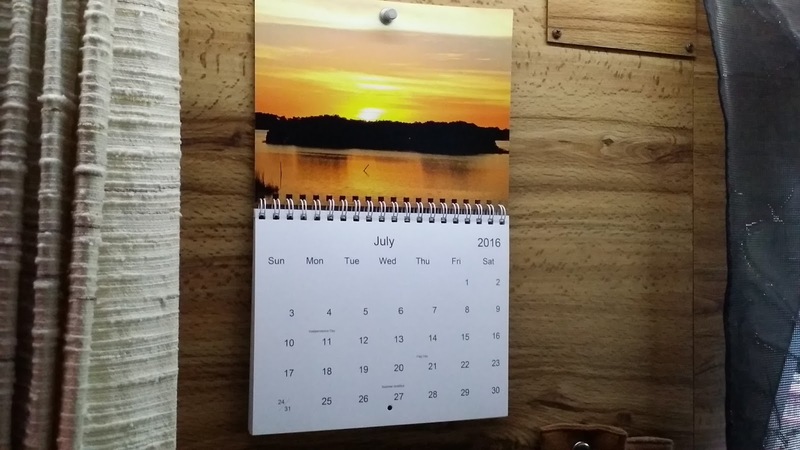 Eventually, usually when I sit down at my computer and look up at the small calendar on the wall near my laptop, I figure out it is Friday, and then I realize I have missed the first round of the British Open which began Thursday. In addition to that the Tour de France has been in full swing for 10+ days.....since both of these sporting events are situated in the Western European time zones I can watch them live at 5:30 am when I get up each day. I see that Phil Michelson carded a record tying 63 Thursday and leads the 2016 edition of the British Open. As I type I listen, with occasional glances up at the TV, to the announcers on the golf channel telling me what they want me to know about Friday's round now in progress......hmmmm...life feels good. The days are becoming routine because it seems everyone has finally settled into their jobs and are getting them done, and are mostly showing up every day for their shifts. We've been able to solve most of our electrical issues so far this summer thanks to our new maintenance manager Adam. 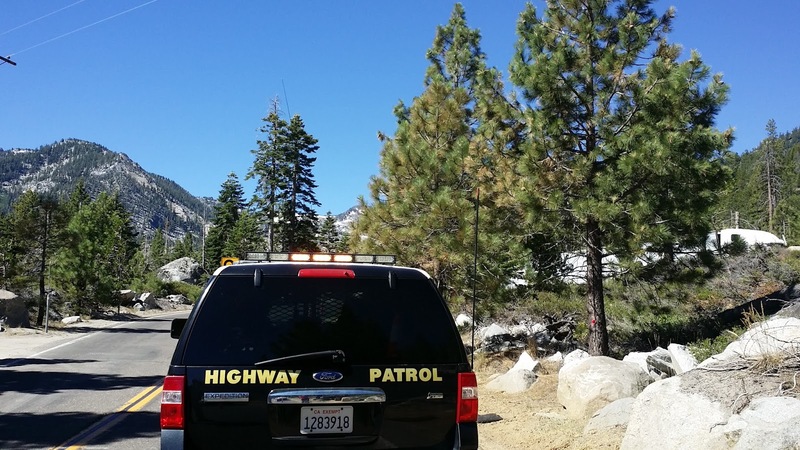 All the new traffic signs we have installed are helping traffic move smoothly throughout the park, and the new stop signs are slowing things down noticeably. Thursday we found ourselves at just over 80% of capacity.....like I wrote yesterday, we are in the 'sweet spot' right now, and all the hard work we have put in since early May is beginning to pay dividends.....it feels like cruise control. There is nothing remarkable to report about Thursday......we took our usual pallet of ice delivery, I pumped propane, I made my rounds, answered questions, helped folks into their sites, calmed a couple of guys down who were determined to have an argument with me, but ended up shaking hands at the end of it all. ......we ate dinner alfresco once again.....I grilled some 'dogs and TLE provided some rice and a small caesar salad as the sides. Thursday was everything I love about spending the summer in South Lake Tahoe! One of the things I like about my job here at TVC is that no two days are exactly alike. Every day presents different challenges, new projects, and an occasional surprise. After completing my morning rounds I spent time at sites 294 and 336 which happen to back up to each other. I wrote about placing logs at these sites a week, or so ago to better define the boundaries of the two sites. 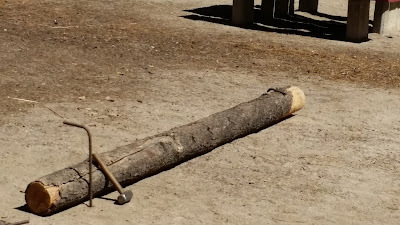 Unfortunately unless these logs are secured to the ground they will inevitably be moved by humans, so Wednesday I went back to pound some 'L' shaped rebar into the ground to be sure they are not moved to increase the size of one site, or another. We're in that sweet spot between the 4th of July blowout weekend and the arrival of the church groups at the end of July. The park is about 75-80% full, but running smoothly. There is that fine line between our current capacity and 100% where things go from running smoothly to seeming organized chaos. When the church groups arrive (one after the other) we will go to close to 100% again and we will be juggling a lot of balls in the air for about 3 weeks. I 'clocked out' around 3 pm as I was an hour over my 40 hours for the week coming into Wednesday......TLE followed an hour later. 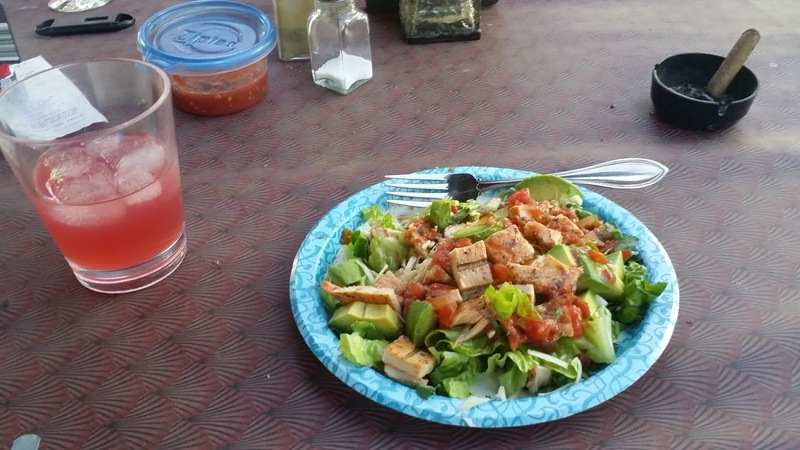 She headed off immediately to Raley's to do some shopping and came home with a large ahi tuna steak for me to grill. She added cooked spinach and barley sides.....we ate outside once again......the early evening weather is just perfect right now! "In-N-Out, that's what a hamburger's all about"